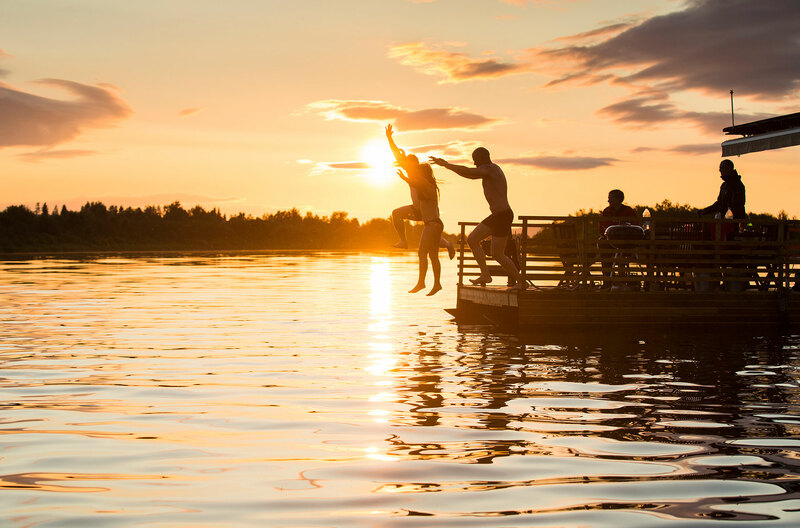 The Midnight Sun – also known as the nightless night or polar day – can be seen in Rovaniemi from early June until early July, and nights are white throughout the summer. The Midnight Sun is a natural phenomenon that takes place on and above the Arctic Circle in the summer months. 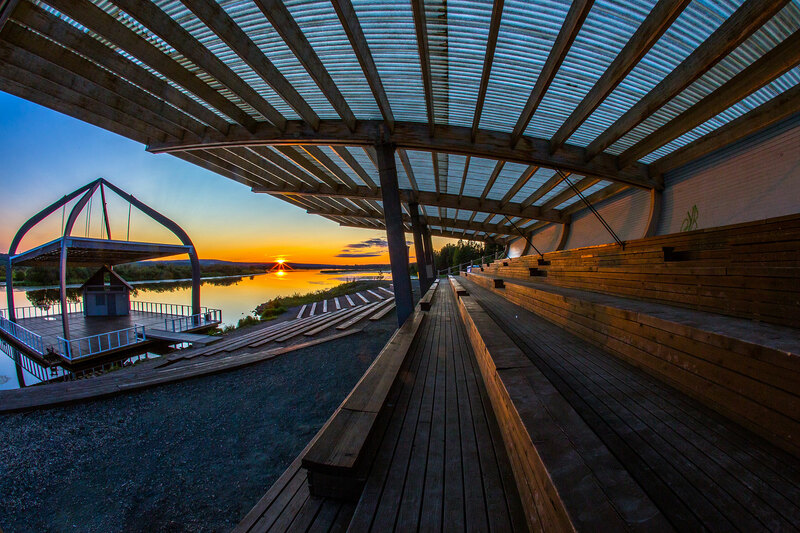 On the Arctic Circle, where Rovaniemi lies, the sun officially stays above the horizon for a full 24 hours on summer solstice, 21st or 22nd June. 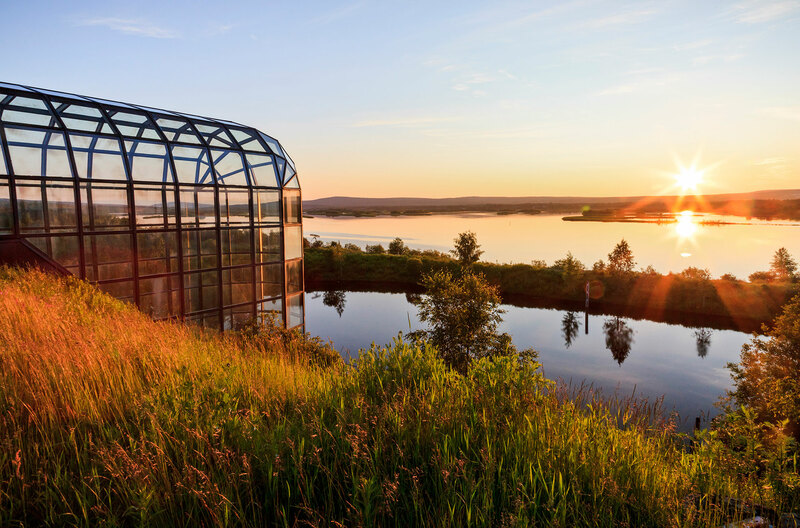 However, the Midnight Sun period in Rovaniemi lasts for a month, from 6th June to 7th July; this is due to the Earth’s slightly tilted axis and refraction of sunlight. In Rovaniemi, nights are white throughout the summer from late May until early August. This means there’s 24 hours a day for activities like jet skiing, horseback riding, floating, hiking, river cruises, visiting husky and reindeer farms and a whole lot more – pretty much anything you can do during the day, you can do in the night. Sleep? Do it later! 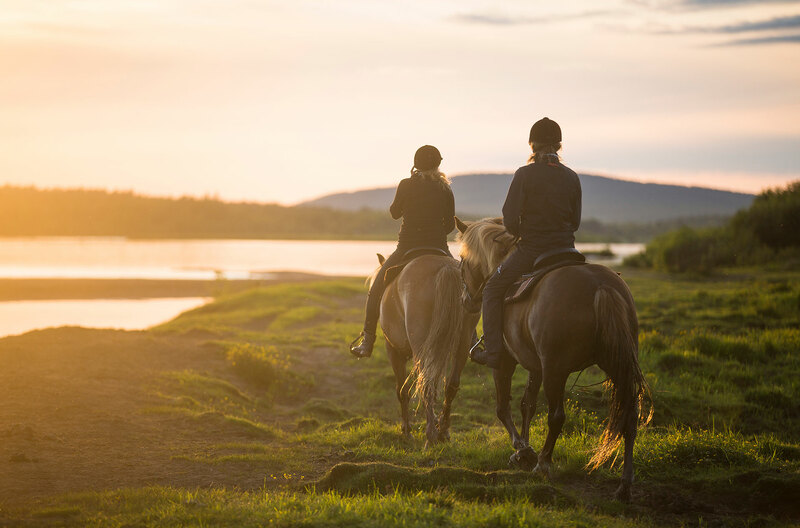 The Midnight Sun can be experienced in a variety of ways in Rovaniemi, from hiking the tops of fells to boating on rivers and getting cosy around campfires. Expert guides show special spots and, with their in-depth information and stories on the phenomenon, broaden the overall experience substantially. Seeing the Midnight Sun doesn’t take much of an effort in Rovaniemi. Next to the city centre, places like the Jätkänkynttilä (“Lumberjack’s Candle”) Bridge, Ounaskoski beach and the Arctic Garden are great viewing spots within a 10-minute walk from the city centre. 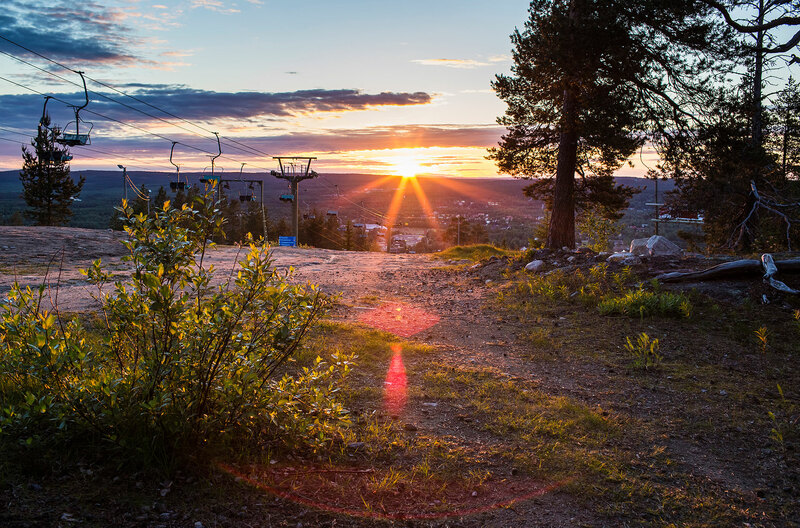 Hiking to the top of Ounasvaara fell takes approximately 45 minutes, but the trip is rewarded with magnificent views of Rovaniemi bathing in the golden light of the Midnight Sun. The only things that could keep you from seeing the Midnight Sun during the season in Rovaniemi are clouds. As long as it’s not fully overcast, you will experience the phenomenon. Visitors are happy to know that spending a few days in Rovaniemi during the season and not seeing the Midnight Sun is highly unlikely. How Will I Sleep When It's Light Around The Clock? Many visitors think it must be hard to sleep with 24-hour sunlight, and to be fair, even many locals struggle with it. On the other hand, many think the short Lappish summer wasn’t designed for sleeping in the first place; the Midnight Sun increases energy levels, so why try to sleep when you don’t feel like it? Just step outside and enjoy the serene summer night. 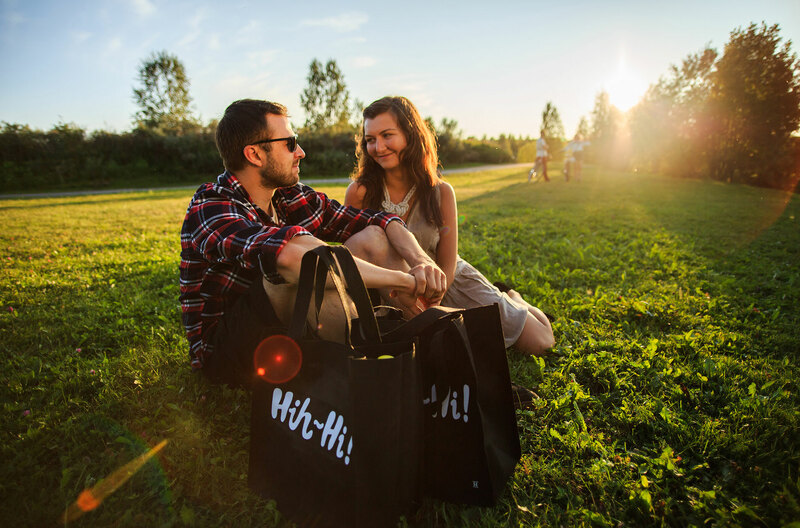 Finland loves its summer events and Rovaniemi is no different to the rest of the country. There’s always something going on from markets to sports happenings and cultural events. Parties often last into the wee hours and sometimes even well into the next day, because the non-existent night is rather easy to skip! Santa Claus	There’s no place like Rovaniemi, the Official Hometown of Santa Claus, for a genuine Christmas experience. Northern Lights	Experience the magic of the Aurora Borealis in Rovaniemi. Midnight Sun	The Midnight Sun – also known as the nightless night or polar day – can be seen in Rovaniemi from early June until early July, and nights are white throughout the summer. Four Seasons	All four seasons are clearly present in the annual cycle of Rovaniemi. However, many locals would say the year consists of up to eight seasons, each with their own distinct characteristics. Arctic Circle	Rovaniemi is the capital of Lapland situated right on the Arctic Circle, which makes the town a gateway to the Arctic. Snow And Ice	For many, Lapland is synonymous with snow. In Rovaniemi, there’s white stuff on the ground for approximately six months of the year. Local Food	Lapland’s food culture is directly linked to its pristine nature, and Rovaniemi is a great place to explore the fresh produce of northern forests and waters. Architecture	Rovaniemi is proud to have several major features designed by Alvar Aalto, one of Finland’s foremost architects. Other visionaries have also embellished the city with landmark structures. Authenticity	Rovaniemi is an urban outpost amidst wild nature, where age-old traditions meet modern life.